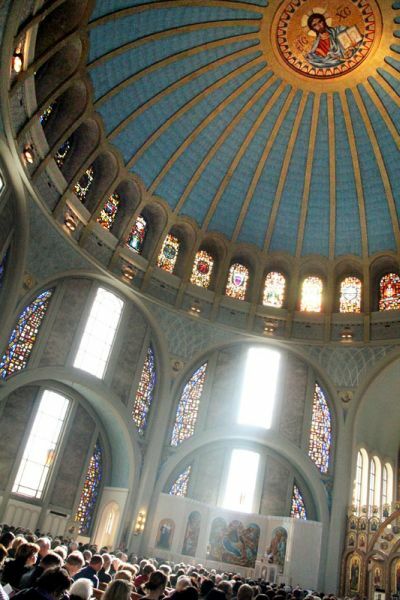 The golden-domed Ukrainian Catholic Cathedral of the Immaculate Conception, located at 830 North Franklin Street in Philadelphia, is now open for visitation, prayer, veneration and meditation. Visiting hours from Monday of Holy Week through Holy Thursday are 4 p.m. to 6:30 p.m.; Good Friday 12 noon to 8 p.m.; and Holy Saturday 12 noon to 5:30 p.m.
Beginning Wednesday, April 8 and thereafter, the Cathedral of the Immaculate Conception will be open Wednesdays 11:30 a.m. to 3 p.m. and Saturdays 2 p.m. to 4:30 p.m.
View the full-size replica of the Shroud of Turin, which is authorized by the Vatican, venerate the relics of Blessed Bishop Martyr Mykola Charnetsky, CSsR., and Blessed Sister Josaphata Hordashevska, S.S.M.I., and experience the traditional Byzantine icons and mosaics. All are welcome and encouraged to visit the golden-domed cathedral in Philadelphia. My husband and I have been to the Cathedral many times. It is absolutely beautiful and Mass there seems so much enjoyable than at other Ukrainian Churches.